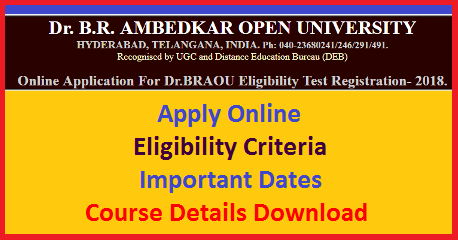 BRAOU offering distance Education Programmes in Degree BA B.Com and B.Sc for working Men and Women in various courses. For Admissions University conduct Eligibility Test. Inviting Online Application Forms from Eligible and intended candidates from both AP and Telangana. Candidates who have not passed Intermediate (or) its Equivalent Examination are eligible to appear for the Eligibility Test for seeking admission into Ist year of the B.A./B.Com/B.Sc UG Foundation Course (3 Year Degree Programmes) for the Academic Year 2018-19, provided they have completed 18 years of age by 1st July 2019. Candidates who not complete 18 years by 1st July 2019 are not eligible to appear for the Eligibility Test. Choose the Study/Examination Centre where you wish to appear for ET-2018 and Collect the Information Brochure on ET-2018 (Free of Cost) from the Study Centre and read it carefully before submitting application form through online. Approach the nearby Study Centre with date of birth certificate/school leaving certificate , along with a latest passport size photo for confirmation. Provide the required information through University website and fill your ET-2018 Registration form through “online” and upload photo and signature. After receiving the SMS from concerned study center, than only the candidate has to Pay Rs.300/- (Rupees Three Hundred Only) by debit/Credit Card through University online OR Rs.310/- (Rupees Three Hundred Ten Only) at the TS/AP online Franchisee Centre towards Registration Fee and obtain receipt.